SecureAnywhere may sometimes detect a file that appears legitimate, but also exhibits questionable behavior. In these cases, it classifies the file as Undetermined. 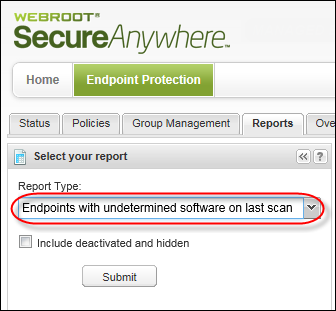 To locate files that SecureAnywhere classified as Undetermined on the last scan, you can generate the Endpoints with Undetermined Software on Last Scan report. You can select an endpoint to drill down for more details about the files. In the Endpoint Protection console, click the Reports tab. 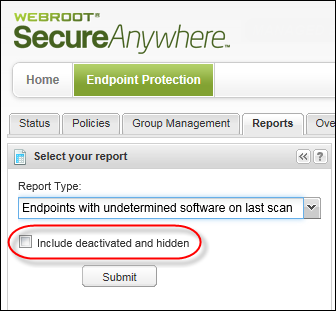 From the Report Type drop-down menu, select Endpoint with undetermined software on last scan. The report displays in the right pane, showing all the endpoints. To view more details about the undetermined software found, click an endpoint's row to see details in the bottom. Good — Always allow the file to run on the endpoint. Do not detect the file during scans or send it to quarantine. After you select Good, the file is listed in the Overrides tab with Good as the Manual Determination, but the Cloud Determination remains Undetermined. Bad — Always send the file to quarantine when detected during scans. After you select Bad, the file is listed in the Overrides tab with Bad as the Manual Determination, but the Cloud Determination remains Undetermined. You can also select whether you want to apply this override to all policies or selected policies, so you don't need to create this override again on other endpoints. To show or hide additional data for the report, click a column header to display the drop-down menu, then select checkboxes to select, add, or remove columns. For more information on descriptions of the data in the columns, see Sorting Data in Tables and Reports. To download a report spreadhseet, see Downloading Report Spreadsheets.